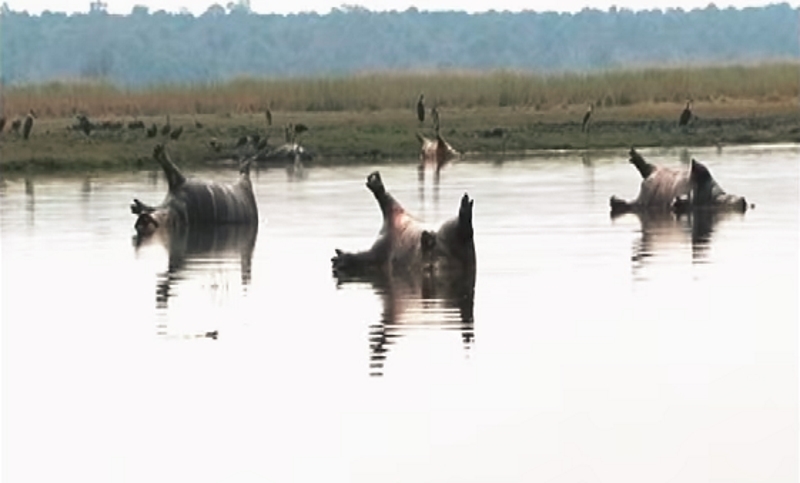 Screenshot of a Namibian Broadcasting Corporation (NBC) report on YouTube showing lifeless hippos in Namibia. Namibia's Ministry of Environment announced on October 10 that about a hundred hippopotamus carcasses had been discovered in Bwabwata National Park, in the northwest of the country. The hippo hecatomb  represented a loss of more than 8% of hippos living in this Namibian national park, in a country that heavily relies on its biodiversity and ecosystem to attract tourists. From available data, tourism contributes  to 16% of the gross domestic product (GDP) and 17.7% of the total number of jobs. Authorities in the Bwabwata National Park  in northeast Namibia have reported a suspected outbreak of Anthrax that has killed over a hundred Hippopotamus in the last week. Tissue samples from the animals have been sent for testing, and the cause of the disease has yet to be confirmed, but no other disease is known to be able to rapidly kill large numbers of Hippos in this way. Concerns have also been raised that the disease may have affected other animals in the park, particularly Crocodiles that are likely to have fed on any dead animals in or close to a river. Photos  and video from local news outlets showed the carcasses lying in the water, many belly up. If the cause of death for all those hippos (found belly up in the water) is really anthrax, they might not be the only victims of this illness. A number of water buffaloes have also reportedly been found dead. Moreover, the crocodiles feeding from the dead hippos might also be infected by the Bacillus anthracis bacteria. The locals and the Namibian authorities suspect an epidemic of anthrax was behind the death of 300 people in 2004 (after they drank contaminated water), as well as another less serious incident in 2010. “This is a situation that we have seen before. It happened in Zambia before and it mainly occurs when the level of the river is so low,” explained Colgar Sikopo, the director of the parks and responsible of the fauna in Namibia. In addition to anthrax outbreak, scientists have also recently investigated another mysterious, hybrid strain of the pathogen, linked to the death of chimpanzees, gorillas and elephants. Approximately 5,500 people cohabit with the wild fauna in the region of the Bwabwata National Park. At the moment, authorities are advising them to beware of the contaminated area, and mostly not to consume hippos flesh. “We strongly advise that they must not consume this meat. What we are doing is we are trying our best to burn every carcass to prevent further spreading of the disease, but also to ensure that no person gets to these animals and starts feeding on the meat,” Sikopo told New Era. Anthrax is caused  by a bacteria, Bacillus anthracis, whose spores can lay unnoticed in nature for years or even decades, waiting to be eaten by humans, other mammals and some birds. Charles Patrick Davis, MD, PhD, writing for MedicineNet.com says  the bacteria strikes in many parts of the world, including sub-Saharan Africa, Asia, South Europe, Americas and Australia.